Ukraine is ready to cancel the visa regime for citizens of Romania, but synchronously with ratification of the agreement between Ukraine and European Union on simplified visa regime for Ukrainians. According to an UNIAN correspondent, Foreign Minister of Ukraine Arseniy Yatsenyuk said this in the interview to journalists in Bucharest. Arseniy Yatsenyuk accompanied President of Ukraine Victor Yushchenko during his visit to Romania. A. Yatsenyuk stressed that Ukraine is ready to go for this step and today at the technical level solves an issue on presenting for the Romanian side those privileges, which have citizens of other European countries while crossing the Ukrainian border. “But at the same we note that adoption of the unilateral decision of Ukraine has to be synchronized with implementation (ratification) of all provisions of the agreement on simplified visa regime between Ukraine and EU”, said A. Yatsenyuk. “Ukraine will do all steps, but we need the mutuality principle”, said A, Yatsenyuk, having express the hope, that all this procedures will be finished till the end of the current year and from January 1, 2008 this decision will be put into operation. He underlined that everything will depend on how the ratification will take place in the Ukrainian parliament and also in the European Parliament. According to the words of A. Yatsenyuk, the Foreign Ministry of Ukraine prepared all necessary agreements for the ratification. “In such a way, a ball will be now at the field of the European Parliament, and if everything will go according to the planned scenario, the agreement will come into force from January 1 of the next year”, stressed the Foreign Minister. A. Yatsenyuk noted that during the visit of the President of Ukraine to Romania, they also discussed the issue concerning inter-regional transboundary cooperation, and also issue concerning the signing the agreement on frontier movement. “We put these issues exceptionally to the practical area without any declaration”, said A. Yatsenyuk, having added that the countries will support all infrastructure projects, which will be proposed from the frontier regions. 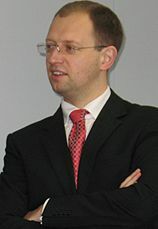 Concerning the frontier agreement A. Yatsenyuk noted that this issue is not so important in the agenda, because there is Soviet current agreement and Romania is not about to join to Shengen Zone, now it is not actual. That is why A, Yatsenyuk noted that the negotiations on signing the agreement on small frontier movement will start later.